Since we had a bit of time this semester after the Gravesend Inn closed, we worked on getting our animatronic pirate back on the show's control network. The pirate's motion, lighting, and sound is controlled locally using A/V Stumpfl's Wings Platinum software V3 (I mixed the soundtrack using Adobe Audition), and controlled from the Medialon Manager which runs the whole Gravesend Inn attraction. 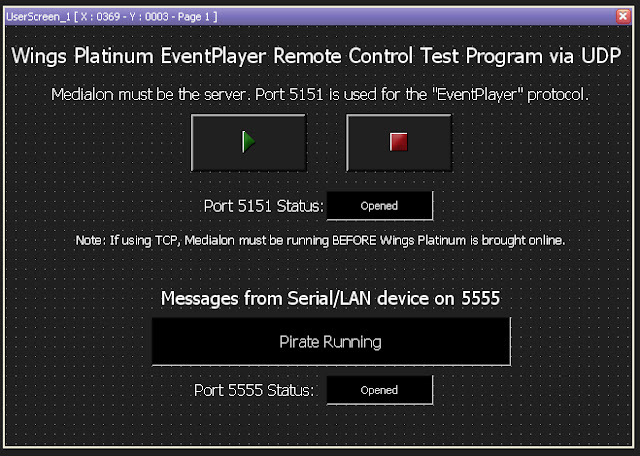 Several years ago, during a software upgrade, the network connection to Wings Platinum, which uses their EventPlayer protocol, stopped working. With the opening looming, I switched to MIDI Machine Control for a couple years, but that doesn't offer all the advantages of being on the show network (which I detailed here).